Decoding of the pictogram at Old Sarum, nr Salisbury , Wiltshire. Reported 5th May 2010. 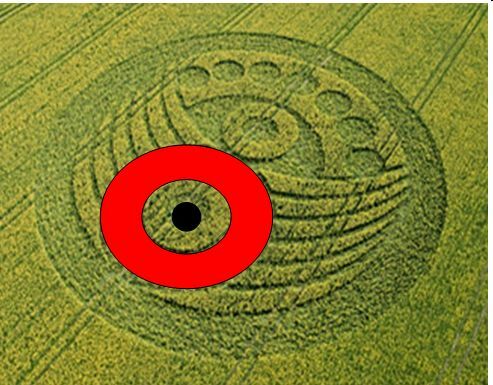 The first pictogram that appeared on fields on 5 May 2010 in Old Sarum, near Salisbury , Wiltshire , England opened the crop circle’s season of 2010. Summary. The only way to avoid global catastrophes for humanity is to make the Transition to the Highest level of the material world through unification of consciousness. Parallel worlds of the material world. The pictogram contains symbols of the united consciousness and dematerialization which determine the features and characteristics of its contents. Extraterrestrial civilizations (ETC) suggest mankind to make the Transition from the level of global cataclysms which will take place at the level of Crystal structures, on the other safe level of the material world. They point out that it can be just only the Highest level. 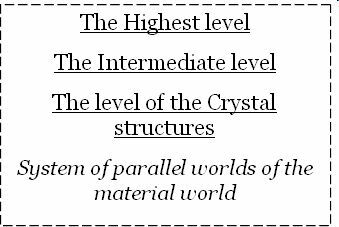 The system of parallel worlds of the material world consists of three main levels. ETC make intergalactic flights in the Universe through numerous sublevels of the Intermediate level of the material world by teleportation. However, for us this level is closed for today, because for teleportation it is necessary to carry out various degree of a body dematerialization. Low level of our consciousness meanwhile is not capable to carry out similar transformations. The consciousness of ETC transfers their bodies on a demanded sublevel of the Intermediate level depending on range of flight in the Universe. The existence of parallel worlds ETC present in very unusual two-levels objects. 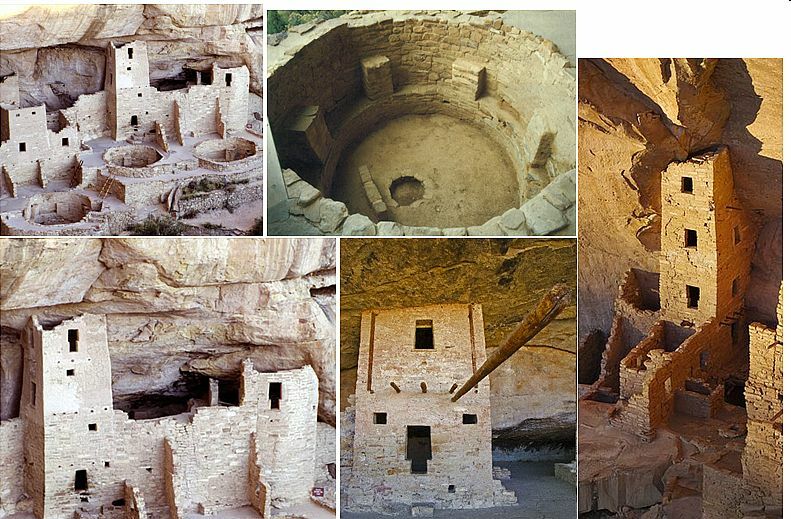 Among them are the Cliff Palace and the Spruce Tree House, located in national park Mesa-Verde in the southwest of Colorado , USA . These complexes have been created not for habitation, but for demonstration the system of parallel worlds of the material world and the present and the future place of mankind’ life in it. Accessory of one or another object to the ETC System of Information Transmission (SIT) is determined by used technologies and also consciousness symbolic in details of constructions. In the presented complexes the Cliff Palace and the Spruce Tree House are presented main analogue symbols of consciousness through which ETC transfer the information also in other objects of SIT. Among them: images of information cells with the shifted brain area, expansion of a brain area at the united consciousness formation and other symbols. Elements of a quantitative method of transmitting information are presented also. For merge rocks with elements of constructions ETC used the similar information technology that they applied in the temple of the Moon and the temple of the Sun in Machu Picchu . The numerous constructions placed inside a rock, inform that today mankind lives at the bottom level of the material world – the level of Crystal structures. The crystal basis of our level is underlined by solid structure of rocks. However, in the system of parallel worlds simultaneously exist other levels. From this point of view the top level of the Rocky palace represents the Highest level of the material world. Today on this level there is no mankind, it is empty. However, just on the Highest level of the material world mankind should make the Transition, escaping from global cataclysms. On the Highest level humanity will continue life in the cycle of the Correction. Besides the material world in the Universe exists also the Information world. Unlike the material world in the Information world there is neither space, nor time. In the Information world the image of human being is represented by an individual information cell. The information cell is the key to an analogue principle of coding of ETC messages. An information cell is presented by a circle with dark ring – an external border. Dark circle in the centre is a brain area.– Area of body is located between a brain area and external border. Information cells. In the pictogram several information cells of human being – both of individual, and the united consciousness are presented. The border of one of individual cells is marked by a wide red ring. The border of each of us individual cell presented by a wide ring, underlines our deepest individuality and an ego. It is revealed by wars and acts of terrorism, hate between people, aspiration to the power, avidity, absence of mutual understanding and million of suicide annually. The sliding consciousness of ETC allows to use the same elements of the pictogram for transfer different information. In this case, inside of individual cell the united consciousness cell is also presented. Moreover, there are two such cells. They are separated by a wide border of an individual cell. It means that our consciousness unification is disturbed by a wide border of egoism. During association of two people consciousness a brain area in each individual cell shifts to a border for information exchange. As a result a brain area of the united cell extends. Association of consciousness in ETC symbolic of looks so. For individual and united cells a range of a brain area expansion is various. So, the individual cell has a small brain area (fig. 1). The united cell of two or several people has slightly expanded area of a brain (fig. 2). Consciousness association of large quantity of people with the uniform purpose corresponds to considerably extended brain area (fig. 3). A brain area of civilization united consciousness cell will occupy almost all the cell. Association of consciousness is accompanied by shift of a brain area of an individual cell. The border of an individual cell with shifted brain area is presented by the big red ring which forms a contour of the pictogram. The wide ring also underlines a huge ego of each of us. A shifted to the border brain area of a cell is shown by dark circle. On the right the analogue from the alphabet of ETC symbols is shown. Half moon of the united consciousness. At the united consciousness formation and shift of a brain area the half moon is formed. Six half moons of the united consciousness are shown in the pictogram centre. They are marked in yellow. In pictograms ETC use two kinds of a half moon – with united horns and with horns directed to different directions. Carbon basis of our life. The individual cell shown by blue color, is placed on six half moons. The number six specifies a carbon basis of our life. As it is known, carbon has a hexagonal crystal lattice, which is often presented in crop circles. Such arrangement of an individual cell on six half moons informs that all people of Earth should form the united consciousness for the Transition to the next cycle of life. Over the last sixth half moon marked by yellow, the part of a circle designated by a dark blue line is represented. Blue line is a border of an individual cell. Near a cell’ border the circle painted in pink is placed. It shows a shift of a brain area of an individual cell at consciousness association. 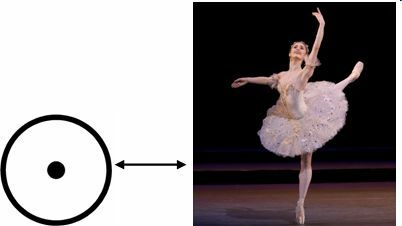 Shift of a brain area once again underlines the main purpose of the pictogram – unification of civilization’ consciousness for the Transition into new cycle of life. A peaked oval of dematerialization and the Transition. On the other hand, the same pink circle with black circle in the centre represents the united consciousness cell. So, this is the symbol «eye of dematerialization and the Transition» - a peaked oval of dematerialization with the united cell in the center. This symbol means that as a result of consciousness association a laser ray will arise. It will remove our bodies from the level of Crystal structures . So, we will disappear from the level of Crystal structures where we live now. At the same moment we will arise again at the Highest level of the material world. This process is known as resurrection. This way our Transition into a new cycle of life will happen. We will make this Transition through the united consciousness action of all civilization. The same principle of the united consciousness action ETC use also for flight between galaxies. The symbol «eye». The symbol «eye» is a peaked oval of dematerialization and the Transition with united consciousness cell inside. This symbol reminds an eye. The Earth –the seventh planet of the solar system. Near an external ring of the pictogram seven small circles are depicted. They presents planets of solar system. ETC in all pictograms counts planets in solar system towards the star-sun according to direction of consciousness development. From this point of view, the seventh planet of solar system is Earth. So, this pictogram informs about our Earth. The pictogram has arisen near the ancient fortification Old Sarum, an Iron Age construction, which was also the base and the site for the first Cathedral in Salisbury built in 1075 AD. The shape of the ancient fortification Old Sarum corresponds to the main symbol of ETC – a cell of the united consciousness. This conformity reveals the main purpose of this pictogram: to warn mankind about necessity of consciousness association because of global cataclysms beginning. Thus, the pictogram warns that in order to escape from global cataclysms humanity has the only way – to make the Transition in the next cycle of life through the unification of consciousness.